Keeping fresh meat in your freezer is a smart way to have food on hand, but one drawback is that it takes quite a while to thaw the meat so you can remove it from the package and cook it. If ribs are on your menu in the next day or two, it's wise to leave yourself plenty of thawing time. In this case, the fastest way to thaw ribs isn't necessarily the safest method. Get all the facts so your thawed ribs taste delicious and don't end up making you sick. Remove the ribs from the packaging. Thaw the meat using the defrost setting on your microwave. Most microwaves allow you choose the weight of your meat, such as 1 pound or 2 pounds, and automatically set the time accordingly. Thaw the meat on a low heat setting if your microwave doesn't have a defrost feature. Cook the ribs right away after you've finished thawing them. Place the ribs in an air-tight sealable bag and ensure that it's closed tightly. This prevents air from getting into the bag while it's thawing. If air gets into the bag, it can encourage bacteria to grow on the meat. Fill a large bowl or sink with cold water and place the bag of meat into the liquid. Don't use hot water. Replace the cold water every 30 minutes until the ribs are completely thawed. The amount of time this takes varies depending on the weight of your meat, but plan on two to three hours for a 3- to 4-pound package of ribs, the U.S. Department of Agriculture says. Cook the meat as soon as it's thawed. Place the package or ribs on a plate or in a large bowl. This helps prevent potential leakage onto other foods as the meat thaws, the University of Illinois Extension notes. Place the plate or bowl into the refrigerator and allow it to completely thaw. The amount of time this will take depends on how much meat you're thawing. The USDA says it takes about 24 hours for a pound of meat to completely thaw. Cook the thawed meat within a day or two. If you end up not using the meat, it is safe to refreeze it. It is safe to cook ribs in their frozen state, the USDA notes, but it will take about 50 percent longer. Don't pull ribs out of the freezer and leave them on your counter to thaw, the USDA cautions. The warm temperatures of your kitchen can encourage bacteria to grow on the meat, and this can make you sick once you eat the ribs. The same goes for thawing the meat on your porch or in the garage. 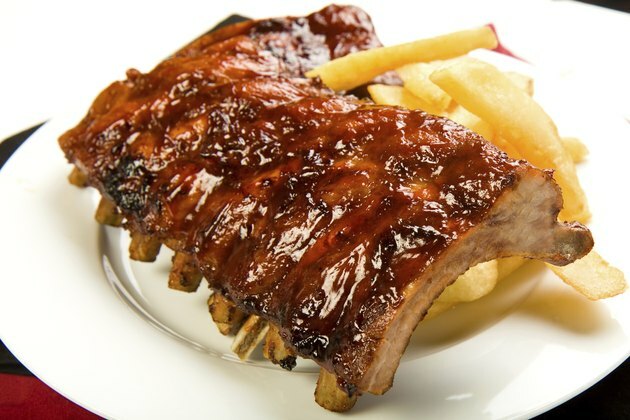 Always cook ribs thoroughly to help prevent the growth of bacteria that can lead to food-borne illness.